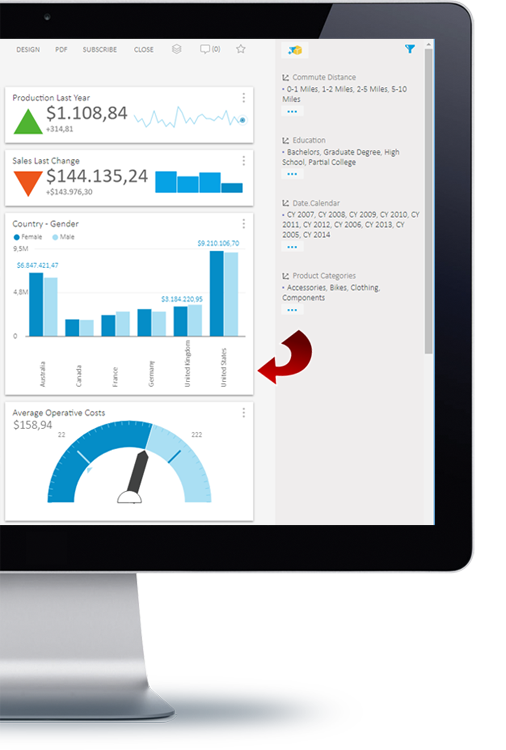 Create interactive Dashboards and KPIs that use your CSV, SQL or OLAP data to visualize insights from your business environment with Kyubit BI dashboard tools. Share Business Dashboards with your team, export to a PDF file or schedule Dashboard subscriptions using 'Kyubit Business Intelligence' dashboard software. 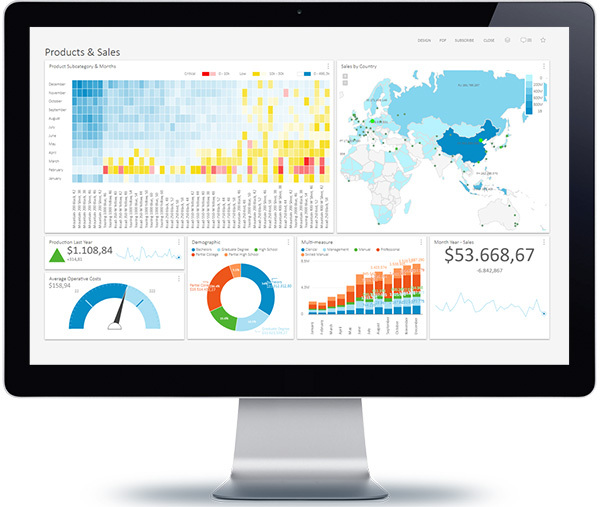 Present important insights from your databases (CSV/SQL/OLAP), displayed as interactive, real-time dashboard visualizations. Use Kyubit BI dashboard tools and its various data visualization options to present relevant data, performance and status indicators. Focus on key values, assign appropriate dashboard permissions and share dashboards with appropriate users. Subscribe and receive business dashboard via email at the scheduled time. Monitor key values with conditional subscriptions that will alert when relevant KPI change its status. 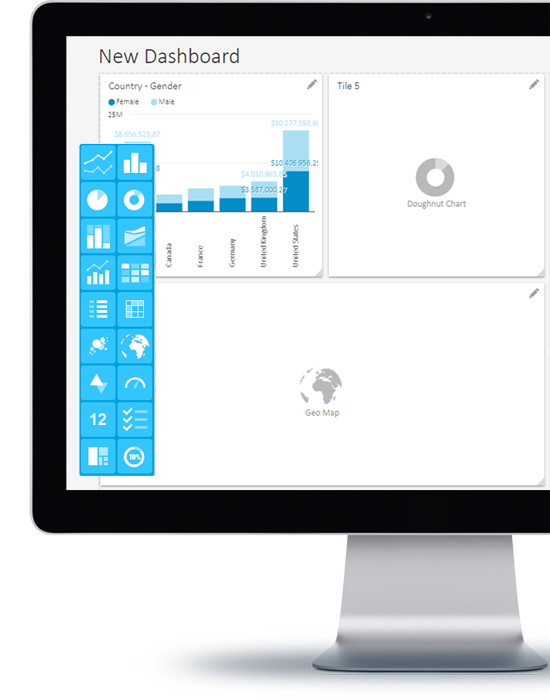 Your own business data on an interactive dashboard with analytic features and subscription options. Use available SQL and OLAP data sources from your own business environment to create Dashboards and KPIs. Use already existing analysis for Dashboard elements using Kyubit dashboard tools. Use MDX and TSQL queries to get data for Dashboard elements. Use drag-and-drop intuitive user interface to create Dashboard elements. Create Key Performance Indicators that quickly reflect important values. Kyubit dashboard tools allow your team to communicate over dashboard with comments and discussions. Use dashboard slicers, drill-down and drill-through operation. Change dashboard filters with URL query string parameters. 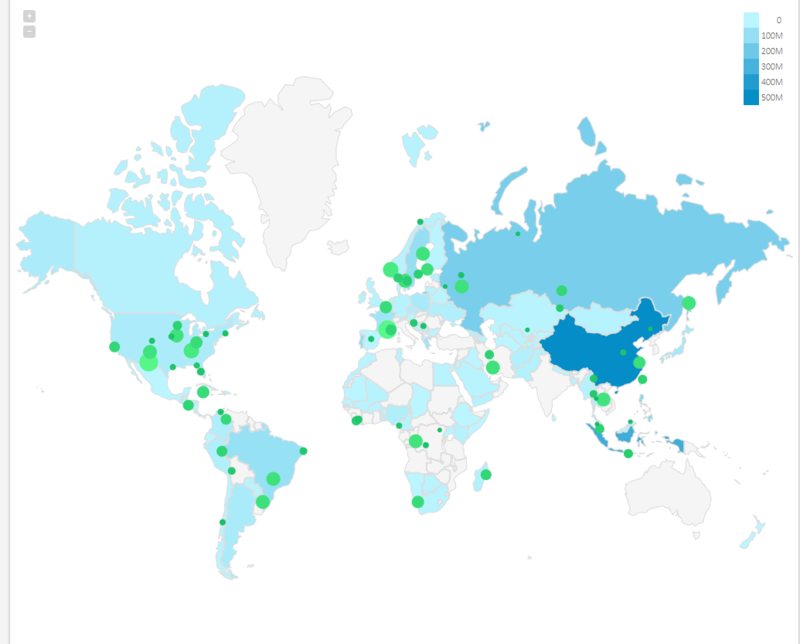 Share Business Dashboards with other people in your environment. Secure way of dashboard interaction with other users based on given permissions. Subscribe and receive fresh dashboards on scheduled time using Kyubit dashboard tools. Monitor important values with conditional (KPI related) Dashboard subscriptions. Use Kyubit dashboard tools to open Dashboard as PDF file. Use Kyubit dashboard tools to organize KPIs to Scorecard collections..
Kyubit Business Intelligence dashboard tools provide simple features to prepare OLAP analysis and SQL/MDX queries as input data for Business Dashboards and KPIs, that would be reused and shared among authorized users. Monitoring of KPIs, Dashboards, and analysis is a simple task, every user can accomplish within a few simple steps with Kyubit Business Intelligence. Allow users to subscribe to created dashboards and receive an email with dashboards data at the scheduled time with Kyubit dashboard tools. Subscription service will deliver dashboard as embedded to the email message, as attached PDF file or link to 'Kyubit Business Intelligence' site. The subscription could be conditional based on KPI current success status. 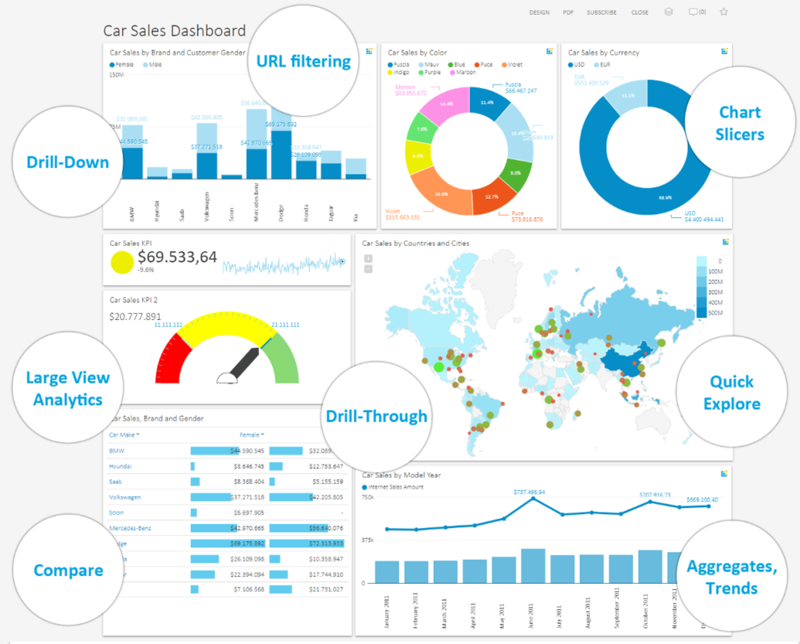 All elements of the dashboard that are based on existing analysis within 'Kyubit Business Intelligence', offers additional value to dashboard usage. 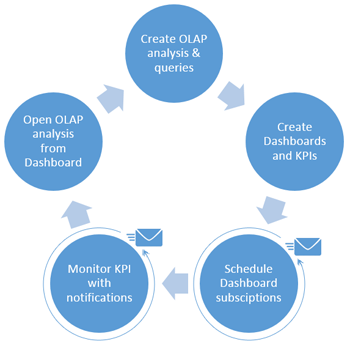 OLAP data based dashboard elements could be filtered by adding slicers that automatically filters all dashboard elements of same OLAP data source. 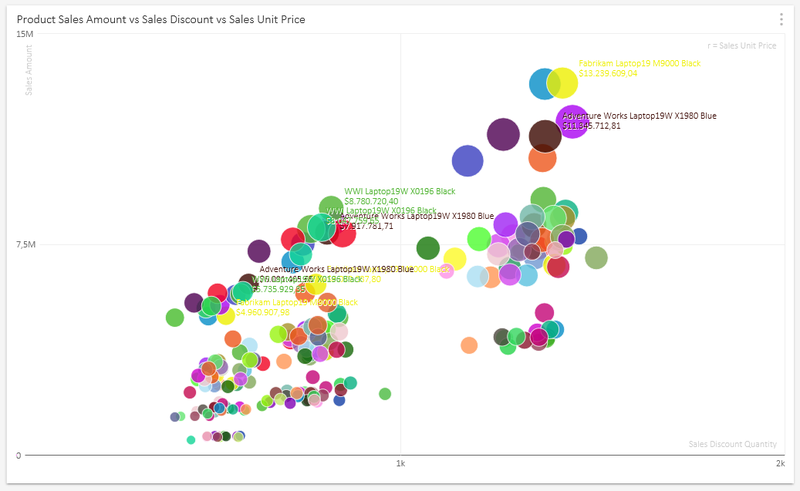 Use drill-down and drill-through OLAP action on a single dashboard element or continue with full OLAP analysis. If created analyses within 'Kyubit Business Intelligence' are not enough to create appropriate dashboard elements, MDX and T-SQL queries are available to create and retrieve data from OLAP and SQL databases. KPIs and other dashboard elements could be based on queries that could be cached for better performance in large environments and secured based on Active Directory credentials. 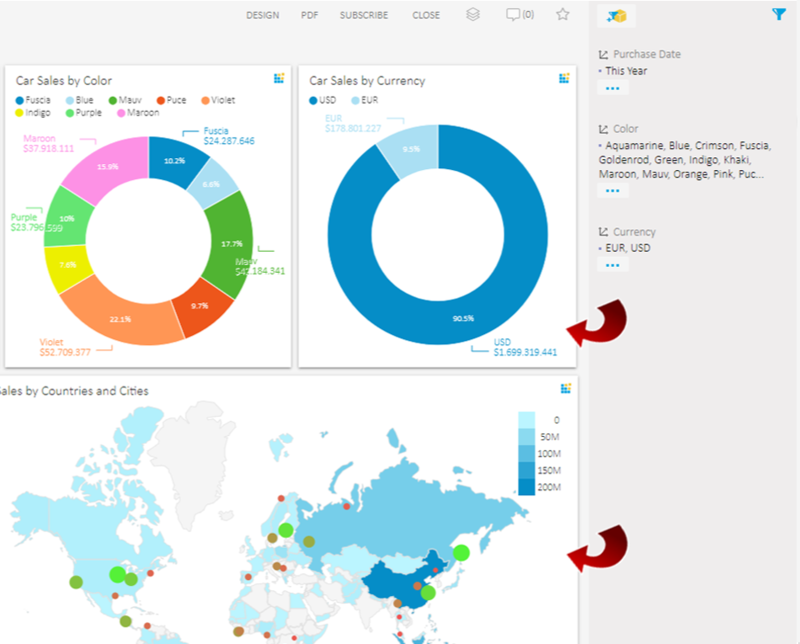 Designing dashboards with 'Kyubit Business Intelligence' dashboard tools is a simple process of drag-and-drop dashboard elements (tiles) to columns on the dashboard area. 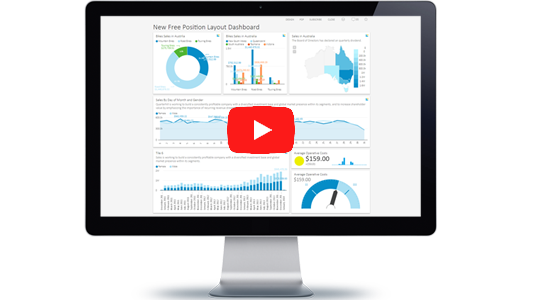 Dashboard author can customize the Dashboard header and footer, size of dashboard columns and at any time drag-and-drop dashboard elements to reorder appearance. 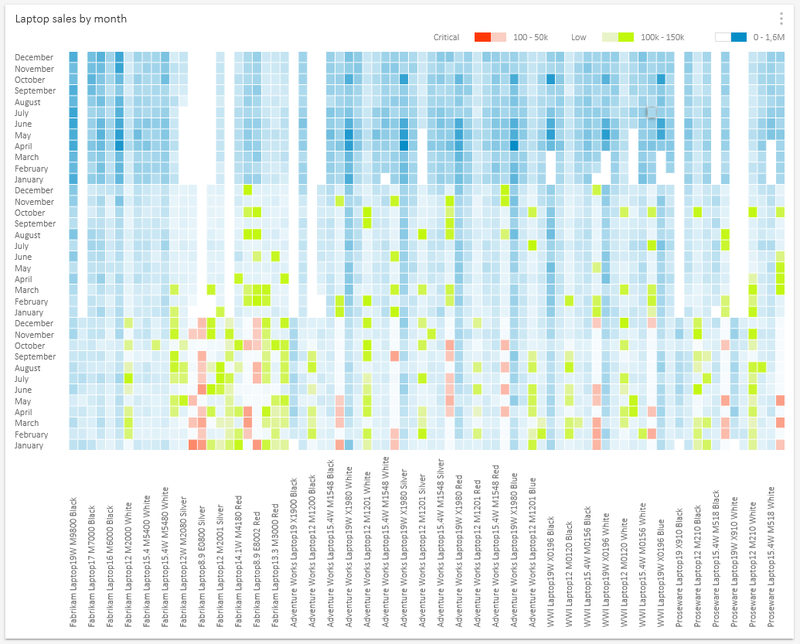 After dashboard tile is defined, immediately renders data visualization. Key Performance Indicators are the important part of any dashboard tools. 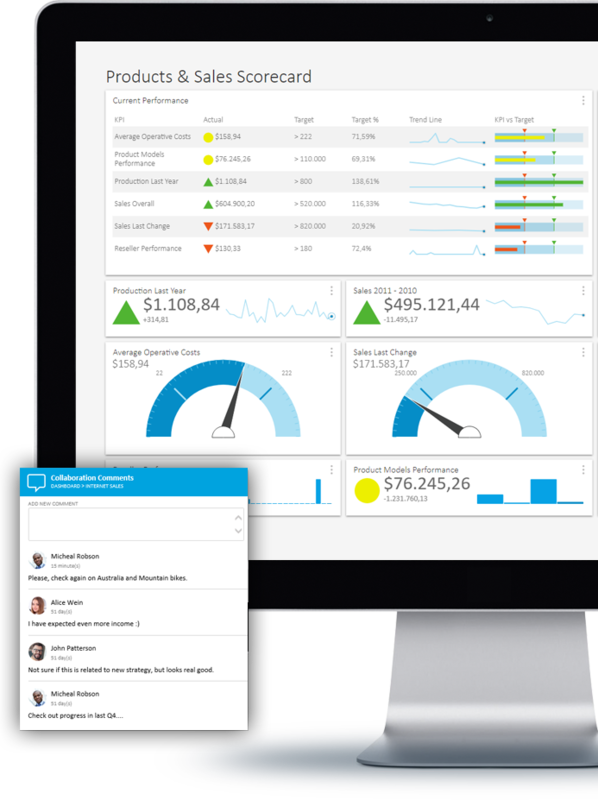 KPI could be created individually or at the time within dashboard design mode. KPI success status is based on values from analysis or MDX/TSQL queries for KPI value, but also for Success and Fail thresholds. 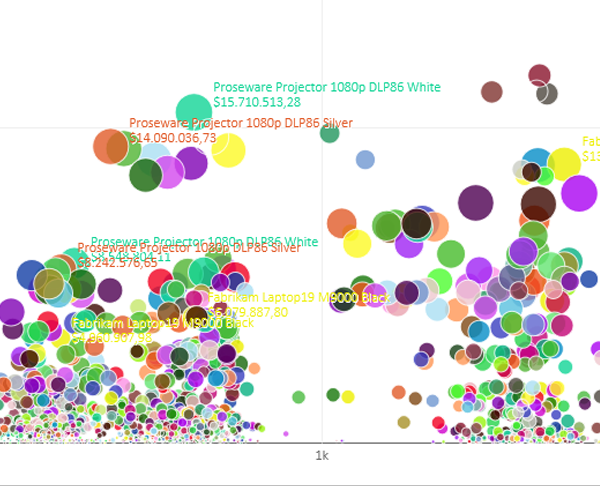 KPI is visualized with value, status indicator, line chart for recent values (if appropriate) and last change (delta). Dashboard elements based on OLAP data source could be filtered by adding slicer that would filter all data on the dashboard related to the same OLAP data source. Multiple slicers could exist at the same time on the dashboard easily visually managed in design time or production time by the end user. Selecting dimension members for filtering, automatically refresh appropriate elements. Dashboard tiles based on OLAP analysis could be in place analyzed with drill-down and drill-through options on the dashboard tile, using Kyubit dashboard tools. Additionally, dashboard tile could be visually enlarged before OLAP analysis actions. Drill-through action will display list with defined OLAP columns to return in the drill-through action, while Drill-by and drill-down will slice analysis by with additional dimension level member. Organize KPIs to a single Scorecard collection to present many important status indicators visually using a single list on a dashboard using Kyubit dashboard tools. 'Scorecard' has its own permissions list to authorize users to manage scorecard KPIs. 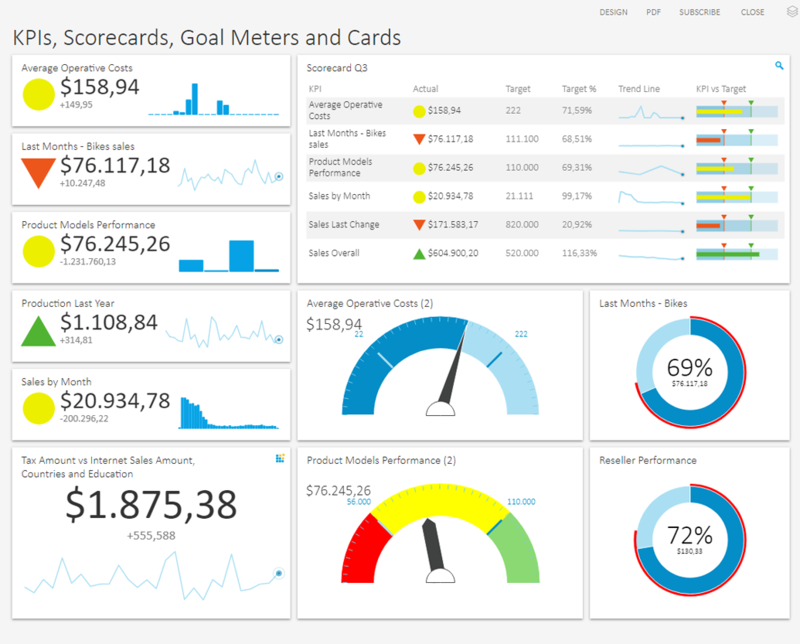 'Scorecard' presents KPI value, goal, trend, trend line, goal percentage, and status indicator icon. 'Kyubit Business Intelligence' dashboard tools include features for users to share comments and make discussions over created BI content, such as a dashboard, within Kyubit BI application. Receive new comments on email to stay in touch with team thoughts on dashboard data and most recent business indicators. Download 30 days evaluation of 'Kyubit Business Intelligence' dashboard tools and see dashboard features in action. It is a simple, 5 minutes-installation that will bring you all features unlocked in the evaluation version. We will be happy to receive your feedback and inquiries. Download Dashboard Tools User Manual, which covers all aspects of dashboard tools & features usage.